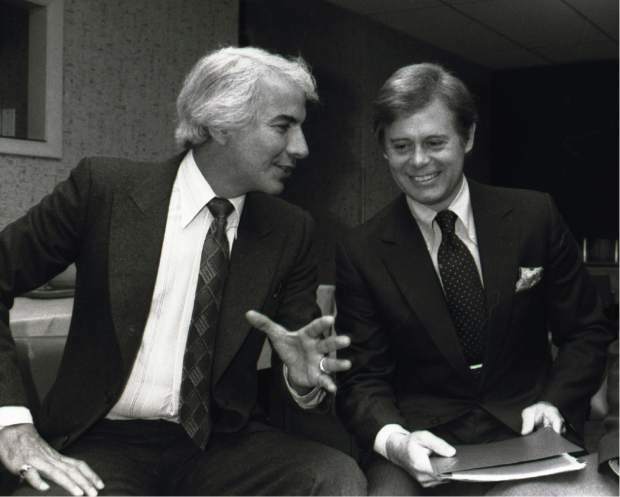 In this March 1979, file photo, Philadelphia Flyers owner Ed Snider, left, talks with NHL president John Ziegler before an NHL Board of Governors meeting in Chicago. Former NHL President John Ziegler has died. He was 84. The NHL confirmed Ziegler's death in a statement by Commissioner Gary Bettman. Ziegler was living in Florida. The cause of death was not immediately known. The NHL confirmed Ziegler’s death on its website, although the cause was not immediately known. He was living in Florida. Two years after he became president, the NHL merged with the WHA. It added four teams from the upstart league — the Edmonton Oilers, Winnipeg Jets, Quebec Nordiques and Hartford Whalers. Bettman said in a statement that Ziegler was “instrumental in the NHL’s transition to becoming a more international league” by increasing the number of European players and opening the door for Russians to compete in North America. Ziegler was from Grosse Pointe, Michigan, and broke into the NHL with the ownership group of the Detroit Red Wings in 1959.